We’ve already seen a new £5 note and a new £1 coin, so it wasn’t going to be long until the release of a new £10 note was announced. 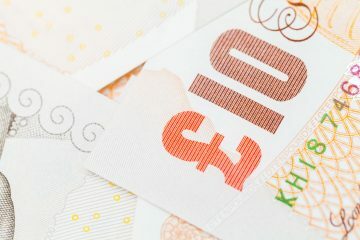 The new note will enter circulation in England and Wales on Thursday 14th September, however production started last August and already over 275 million notes have been printed ready for the launch. On 18th July this year, on the 200th anniversary of Jane Austen’s death, the new polymer £10 note was formally unveiled. The new note “will recognise her universal appeal and enduring contribution to English literature” the Winchester Cathedral said in a recent statement concerning the launch. It’s smaller than the current one but larger than the new £5 note. Made from polymer, the new note is cleaner, safer and stronger than the last. It is expected to last at least 2.5 times longer than the current paper note and stay in better condition. It also contains a long list of sophisticated security features which will make it almost impossible to counterfeit, including Winchester Cathedral shown in gold foil on the front of the note and silver on the back, a quill at the side of the window which changes from purple to orange and a hologram which contains the word ‘Ten’ and changes to ‘Pounds’ when the note is tilted, to name a few. You will be able to continue using your paper £10 notes until spring 2018 and a notice period of at least 3 months prior to the withdrawal date will be given. Here at Leotronics we know about cable assemblies and connectors. Our technical knowledge has provided solutions for businesses around the world in manufacturing within automotive, financial, domestic engineering industries and more. Contact us to see how we can support your design aspirations and help you achieve more.